According to some estimates, the world's oceans might go essentially fishless by 2048, depleted by overfishing and overconsumption. 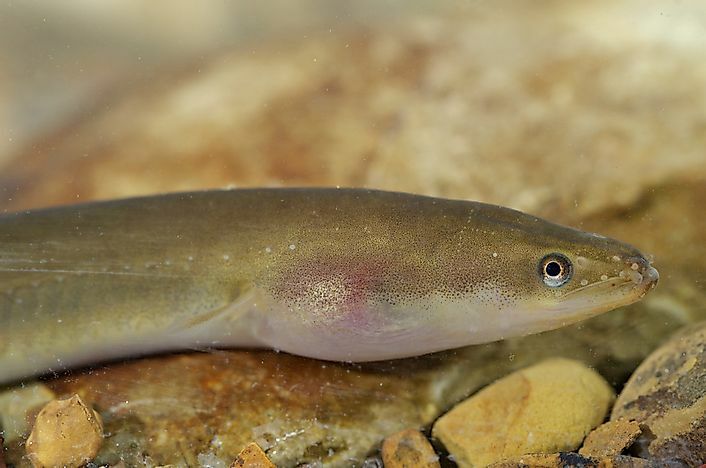 Traditionally used to make the English jellied eel among other delicacies, the European Eel is now Critically Endangered. Around 71% of the earth’s surface is covered in water, and 97% of that is salt water, such as that found in oceans and seas. These bodies of water are filled with a large portion of life on earth which includes everything from plants to mammals and fish to tiny organisms. Humans rely on this marine life for a number of reasons, but mainly as a food source. For this reason, marine life is in danger. The worldwide demand for seafood has led to overfishing practices, leaving fisheries depleted or nearly so. Over 85% of the global fish population is overexploited, depleted, or in recovery. Scientists believe that in just 30 years, seafood may be gone. Fishing has decreased edible seafood species by 29% in a very short time and that figure doesn’t even take into account the countless other marine animals that are lost during the process (coral, turtles, sharks, seabirds, and dolphins). Despite the risk to marine life, seafood continues to be in demand. Even species that are threatened, vulnerable, or endangered are still being fished and consumed. This article takes a look at why certain marine creatures have become at risk. What Are Humans Doing That Is Threatening Marine Species? As coastal fisheries have been overfished and quickly depleted, fishing vessels have moved out into deeper waters to search for fish. Unsustainable demands are continuing to spread and some fish are in serious risk of extinction. A list of the most vulnerable marine life can be found below. The reason for their threatened status is due to a number of factors. One of these causes is that the fishing industry simply catches whichever species has the biggest market demand, including vulnerable species, with no regard for the animal’s ability to recover from the loss to its population. Management chooses not to follow scientific advice on catch limits and instead, they set their quotas at much higher, unsustainable levels. This practice has had an extremely negative impact on Atlantic cod and tuna species. When management chooses not to follow limits set by the scientific community, it results in overfishing. Overfishing occurs when more fish are caught than can be replaced via natural reproduction. The consequences of this are far reaching, not only does it decrease biodiversity, but also affects populations that rely on subsistence fishing for survival. Tuna species are disproportionately affected by this practice, particularly the Atlantic bluefin tuna which is now endangered. Overfishing has contributed to the threatened status of every species on the list below. Similar to overfishing is the use of unselective fishing methods. The root behind these two practices is in the pursuit of quantity. In unselective fishing, fishers employ a type of free-for-all approach in which as many fish as possible are caught. Unwanted fish harvested as bycatch are then thrown back into the sea after they are dying or already dead. This type of fishing has no regard for sustainability and often kills immature fish, prohibiting them from breeding and increasing population size. Destructive fishing practices are another cause for decreased marine biodiversity. In the 1980’s, the fishing industry began using rockhopper trawls that allow fishers to move into rocky regions and coral reef ecosystems that were previously avoided. This machinery drags along the ocean floor moving rocks and destroying coral. Bottom trawling can be compared to deforestation as it removes coral, shelter, and food resources for many marine species. Fishing with cyanide is another destructive practice that allows fishers to stun fish without killing them to meet the demand for live fish in many restaurants. For every live fish caught, 1 square meter of coral is lost. Dynamite fishing is similar, although it kills the fish on contact, and they then float to the surface, and the fishermen collect them in nets. More than just the desired fish are killed by utilizing this technique. Another indirect destructive practice occurs when fishing gear is lost at sea. Although no longer in use, the nets, hooks, and traps continue to catch marine life such as turtles, dolphins, whales, and a variety of fish. Destructive fishing affects all the species on the list below except salmon, marlin, and eel. Pirate fishing also occurs. Pirate fishers have zero respect for fishing laws and often catch illegal fish or set up operation in no-fish zones. Their catches go unreported and unregulated which presents a huge problem for sustainability attempts. Fish from the list most affected by this are sharks, skates, rays, and tuna. You can become involved in the fight to conserve marine life. The simple act of purchasing is the very thing that drives the fishing industry to continue with its practices. So, choose wisely. Purchase seafood that has been caught by small, local fisheries. Look for alternatives to the species on this list, choose line-caught fish whenever possible to avoid the unsustainable practices mentioned above. Buy organic because of the high environmental standards required for the label. Try to avoid farm-raised fish because it takes 3 metric tons of wild-caught fish to produce 1 metric ton of farm-raised fish. Stick to herbivorous fish such as tilapia, because their loss doesn’t affect the food chain as much as the loss of predator species. Above all, remember that purchasing is power.